This interview appeared on the Library of Erana blog a few weeks ago. Thanks very much to Alexandra Butcher for permission to publish this. Please tell us a little about yourself. I am 5’11’, dark hair, short – Army cut, slightly curly. Green eyes. Describe your appearance in 10 words or less. Getting middle aged, slightly paunchy with drying skin – like paper in places – except my mech arm. That’s synthetic skin on there and as smooth and supple as the day it was sprayed on. I even had mine tattooed but don’t tell anyone. Would you kill for those you love? I kill every day – most days – to keep my culture intact. I would say that is killing for those I love. Of course there is a moral code… And as a soldier the moral code is almost everything. After a while… killing… it sometimes seems to be the only thing you have left. Family are too far away. Do you like animals? I love animals. Their love is unconditional. You can never quite be sure with humans, can you? Do you have a family? Ha! Ha! Yes. A test-tube. No seriously my mother – Mary, my sister Justine and a dog – a collie called Frisky. My adoptive dad was the famous robotics designer Robert R. Nanden but he’s dead. My mother was his assistant and pretty accomplished at that! Can you remember something from your childhood which influences your behaviour? I am not sure about any of my childhood memories. They are probably all implanted. I am a replicant. The first memory I am sure about is playing on the grass with my adoptive mother watching me playing cricket. Do you have any phobias? Mirrors. Can’t stand them. They make me sweat and… well, I’m very nervous around them. I avoid them. Please give us an interesting and unusual fact about yourself. I write books – well, I am writing my first; a detective thriller. It’s kind of Raymond Chandler-ish. I call it Chandleresque, but I guess that’s bad English. My adoptive parents are first generation J5 – that’s a space station – so they kinda inherited a USAC – United States of America and Canada – accent. Anyway, I am rambling. The main character is Dusty. He’d a sucker for the pretty ladies! Please give us a little information about the world in which you live. Well, I was born on Mars – at least I was adopted on Mars. We lived under a dome for most of my childhood. My most precious memory is of my dad taking me out on a hoverbike to see the real Mars sunset. Of course, you could see sunsets from the dome, but the U.V. protection took out most of the colour and I had nagged him for weeks to take me outside to see one. With difficulty, because my fingers were so small, I lifted the outer U.V. filter and gasped. The white disk of the sun almost burned a hole in my head. Its white was so intense it was almost blue and the blue became a corona as my eyes quickly looked up and away from it. The corona gradually faded into a riot of colour that filled the rest of my vision. The purples and oranges were deeper than those in a bowl of the freshest and most tangy grapes and peaches. Does your world have religion or other spiritual beliefs? Do you travel in the course of your adventures? If so where? That’s three questions in one! Yes of course there is religion but I struggle to believe in anything other than a goal of justice – for my friend’s death. We have the usual Christianity, Islam and Hinduism, and a few others that go way back on Earth. Plus we have the got Mech! Well, what can I say about him? It started with cyborgs and androids worshipping the God of mechanical things. They believe Mech created humans to service the machines. Lately even replicants are converting. Most replicants find it difficult to have faith in anything other than themselves. Does your world have different races of people? If so do they get on with one another? We are more concerned with Ischians – aliens. We call them ‘Dogs’ because they have evolved from something like dogs. Pretty formidable though… You don’t want to mess with Ishuns. Races? I don’t think anybody notices any more. Still a stigma to being a replicant though. I think that’s where people’s racism has gone. Name a couple of myths and legends particular to your culture/people. Mech, the god for all A.I. beings, as robots and androids were now permitted to call themselves, lived in a red world of dust which corroded him and he had three sons, Iron, Tin and Wire. They lived in the desert for they were afraid of the sea, but one day Iron, who was the eldest son, committed a sin by openly doubting Mech and Mech banished him. Iron wandered alone until he came to the sea, and left his mark upon a rock but no more was ever heard from him again. I guess the other one is that God looks after us all. Replicants don’t agree. You should see the size of funeral urns replicants get. Then you would know all about inequality. Book(s) in which this character appears. 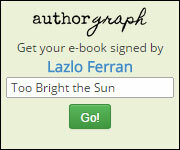 Pingback: Lazlo Ferran | Science Fiction eBook – Too Bright the Sun – is FREE this weekend!